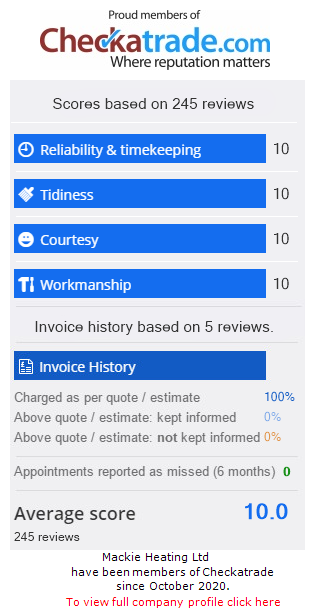 Please click on the checkatrade image below to see our testimonals. Mike did a first rate job installing an expansion vessel to my 8 year old Worcester Bosch. This was a much cheaper and quicker solution to getting the boiler working properly again than was advised by another company who didnt even give me that option and wanted a lot more money. Fair play to Mike he arrived early as agreed and had the vessel fitted and was all cleaned up within a few hours, it looks to be a very neat job and Mike took a lot of pride in his pipework and explained the process as he went along and so I felt very reassured. He actually left my porch cleaner than he found it so I would really recommend using Mackie plumbing and Heating. At the very least get a quote and check out their reasonable rates and you won’t be disappointed. Mike came and checked my boiler, fire and cooker were safe for my rental property. had radiators fitted in my upstairs bedrooms. did a fantastic job, relayed all my carpets back and left the rooms spotless. would definately reccomend this plumber.having new boiler fitted in the next few weeks. First time used but will do again! Quick to respond, quick to arrive and helpful when he did. Thanks. great service and explained everything clearly, would definitely use again. Got a call within half an hour of posting. Mackie plumbing came out on a Sunday morning to assess the problem. Ordered parts Monday came to fix only to discover a further unforeseen fault. He spent two hours trying to work a way round it so we would have heating. He came back early Tuesday morning with another part and got it up and running. Great company, Quality work, good prices. He gave me an original quote and stuck to it even though the job took a lot longer than expected. Highly recommended. really reliable service and very friendly. Great job done. Will use in the future. Professional, highly qualified with reasonable prices! Would recommend! Our boiler had broke and we have a new born baby. Mike agreed to come out that evening on a Sunday! He managed to repair the boiler that evening. His price was fair and I would fully recommend him. What a star! Excellent service. Phoned prior to our appointment to let me know he was on his way. Very polite, friendly and reliable. Serviced my boiler and checked all radiators. Will be having my boiler serviced every year!